With the holidays winding down and no yard work or major home repairs to do, I’ve been making time to paint again! Here’s some stuff. I’m still using my phone for photos because although the image quality isn’t as good, it’s a lot faster and doesn’t require file transfers. <Update — turns out you can’t just copy pictures from your Google Photos — they will only be visible to people you already shared them with.> Click to embiggen them. I think the flash really doesn’t do the paint job any favors, but it is a bit messier than usual even for me. 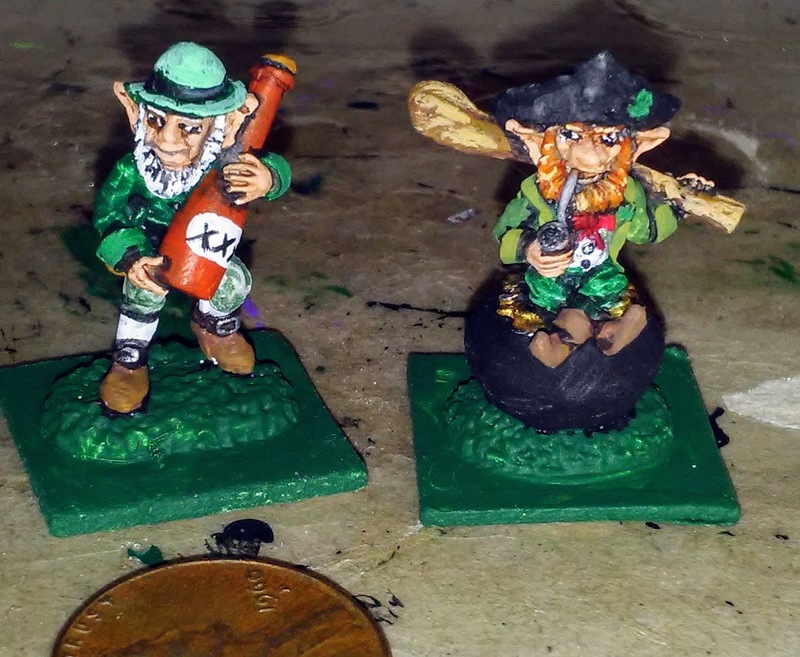 I really rushed these guys to keep ahead of St. Patrick’s Day. 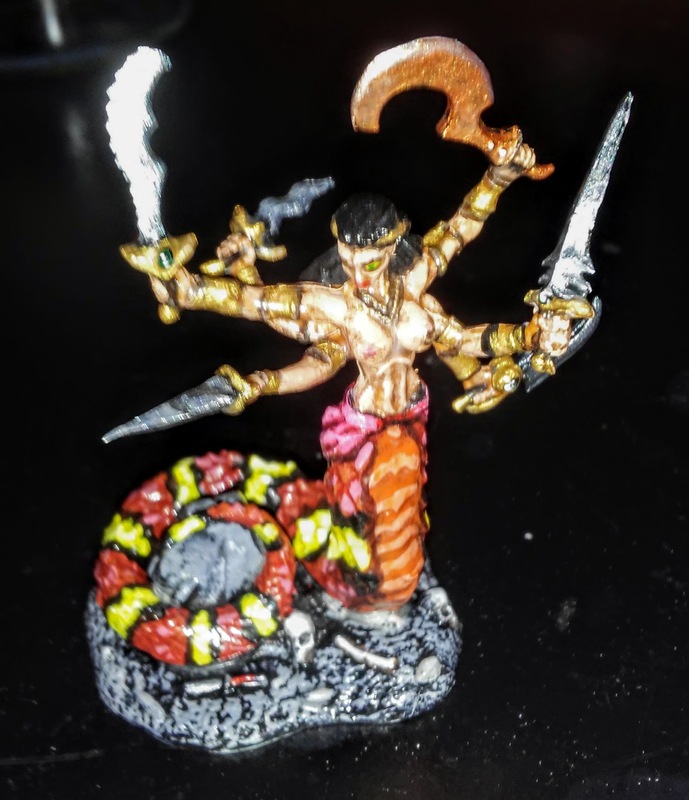 Speaking of sloppy painting, here’s a Reaper Bones marilith. Bones minis are usually pretty crisp but this one’s face has very poor detail and I really couldn’t distinguish her eyes. In the end I painted them like lidless snake eyes. Again, too much flash. 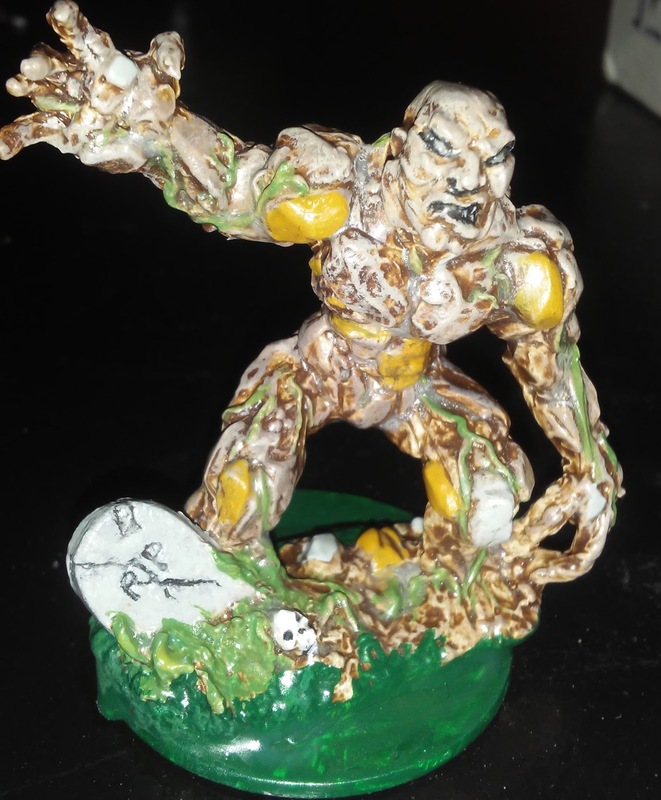 Next up, yet another Reaper mini — an earth elemental. My only gripe with this figure is the tombstone integral to his base. It’s kind of out of place, in my opinion. But it was nicely sculpted. I still need to flock the base. 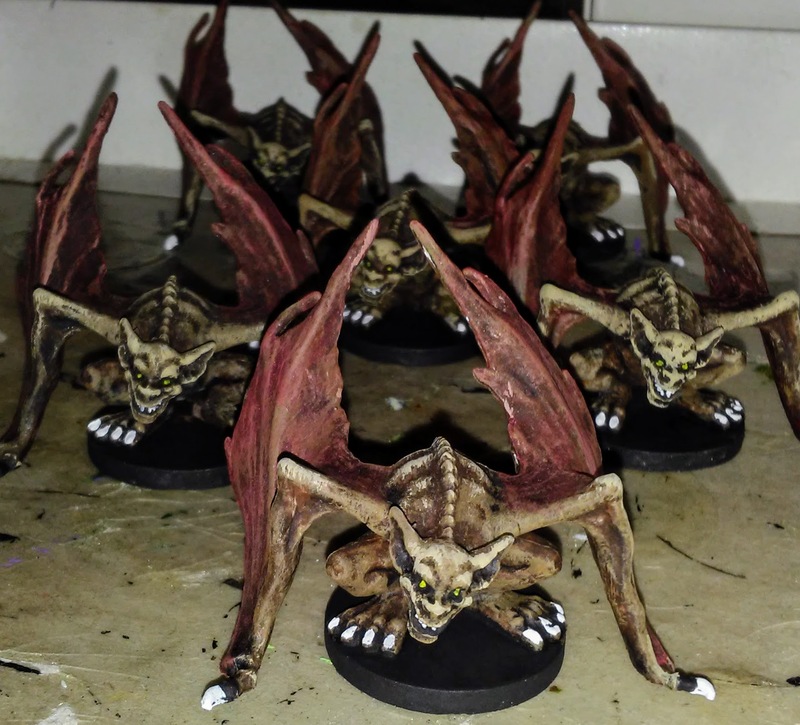 Lastly a passle of “razor wings” from the Descent board game (Fantasy Flight Games). In hindsight I should have done something about the heads — varying the angles of tilt. It would be a simple fix to cut them off and rotate them a bit before pinning them back on. Maybe later. Next time, a whole lotta pirates and adventurers. Well I see them. It could be your phone. This site is optimized to be viewed on a PC, at work, when you should be working. Hi Mike, you seems to have fixed the pics problem – I can see them perfectly in the blog. However, they were broken in your email when I read it online in Firefox. Hopefully it’s just a one-off. Thanks! Yes, it’s definitely a Google thing. Moving forward it shouldn’t happen again. Great work. I especially like this Razor Wings. Very cool.